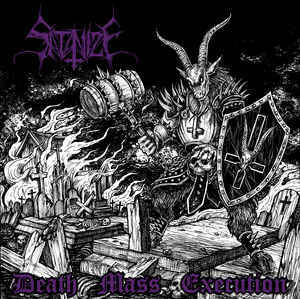 A special EP comprising three exclusive tracks, Death Mass Execution is a quick ‘n’ concise attack capping more than a decade of Satanize terrorizing the underground. Hailing from the fertile Portuguese black metal scene, Satanize forego their scene’s usual withering rawness for a righteously barbaric assault on the senses. Pounding and pulsing, overwhelming its gibbering intensity, Death Mass Execution ably approximates its title: sonic slaughter abounds at every chaotic, careening turn. And yet, for however jagged their bestial blackgrind may be, Satanize wield their physicality with an almost martial strictness – and escape is never an option, only submission. Completed by a noise intro by Erratix (Rick Smith of Caveman Cult/Shitstorm/Mehkago NT and David Smith of Shitstorm/Mehkago NT) and cover artwork by Sickness666, Death Mass Execution is sure to satisfy maniacs of Black Witchery, Conqueror, Morbosidad, and especially old Spear of Longinus and Impiety.